In 2007, Hurwitz & Associates fielded one of the first market studies on text analytics. At that time, text analytics was considered to be more of a natural extension to a business intelligence system than a content management system. 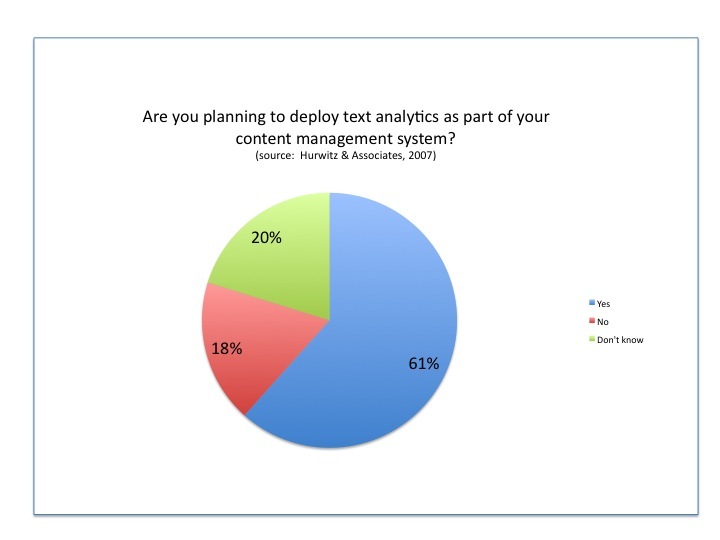 However, in that study, we asked respondents who were planning to use the software, whether they were planning to deploy it in conjunction with their content management systems. It turns out that a majority of respondents (62%) intended to use text analytics software in this manner. Text analytics, of course, is the natural extension to content management and we have seen the market evolve to the point where several vendors have included text analytics as part of the their offerings to enrich content management solutions. Over the next few months, I am going to do a deeper dive into solutions that are at the intersection of text analytics and content management; three from content management vendors EMC, IBM, and OpenText as well as solutions from text analytics vendor TEMIS and analytics vendor SAS. Each of these vendors is actively offering solutions that provide insight into content stored in enterprise content management systems. Many of the solutions described below also go beyond providing insight for content stored in enterprise content management systems to include insight over other content both internal and external to an organization. A number of solutions also integrate structured data with unstructured information. • EMC: EMC refers to its content analytics capability as Content Intelligence Services (CIS). CIS supports entity extraction as well as categorization. It enables advanced search and discovery over a range of platforms including ECM systems such as EMC’s Documentum, Microsoft SharePoint, and others. • IBM: IBM offers a number of products with text analytics capabilities. Its goal is to provide rapid and deep insight into unstructured data. The IBM Content Analytics solution provides integration into IBM ECM (FileNet) solutions such as IBM Case Manager, its big data solutions (Netezza) and integration technologies (DataStage). It also integrates securely with other ECM solutions such as SharePoint, Livelink, Documentum and others. • OpenText: OpenText acquired text analytics vendor Nstein in 2010 in order to invest in semantic technology and expand its semantic coverage. Nstein semantic services are now integrated with OpenText’s ECM suite. This includes automated content categorization and classification as well as enhanced search and navigation. The company will soon be releasing additional analytics capabilities to support content discovery. Content Analytics services can also be integrated into other ECM systems. • SAS: SAS Institute provides a number of products for unstructured information access and discovery as part of its vision for the semantically integrated enterprise. These include SAS Enterprise Content Categorization, SAS Ontology Management (both for improving document relevance) and SAS Sentiment Analysis and SAS Text Miner for knowledge discovery. The products integrate with structured information; with Microsoft SharePoint, FAST ESP, Endeca, EMC Documentum; as well as with both Teradata and Greenplum. • TEMIS: TEMIS recently released its Networked Content Manifesto, which describes its vision of a network of semantic links connecting documents to enable new forms of navigation and retrieval from a collection of documents. It uses text analytics techniques to extract semantic metadata from documents that can then link documents together. Content Management systems form one part of this linked ecosystem. TEMIS integrates into ECM systems including EMC Documentum and Centerstage, Microsoft SharePoint 2010 and MarkLogic. Great post. Part of the future of “enteprise search & information access” will evolve into more global “Content Intelligence Platforms”. And of course they will need to be more tightly coupled to existing CMS, WCM or ECM systems. Your article does not mention in the high-end market niche Autonomy + Interwoven. On the other hand it would be interesting to aslo analyze other lower mid-range alternatives which try to commoditize a bit this still very expensive and costly market niche (e.g: salsadev launches a combo salsaAPI + the open source Liferay CMS as a “Smart CMS” or open source projects such as Apache Stanbol tries to also commoditize and standardize access to semantic content enhancements vendors such as Zemanta, Saplo, OpenCalais, etc…). Better exploiting the wealth of information stored within all our ECM and CMS is certainly one of the next trend for Information Management Vendor to focus a bit less on the information lifecycle and a bit more on the information assets they are storing. Well,these 5 vendors are not the top of the ladder,though IBM is amongst the top out of these 5.what do u guys think of other 4? The purpose of my post was not to rank these vendors. What vendors would you put at the top of the ladder and why?